Theatre credits include: Private Lives (Mercury, Colchester); The Long Road South (King’s Head); The Bogus Woman (National Tour); The Importance of Being Earnest and The Lady in the Van (both Theatre by the Lake, Keswick); The Railway Children (Sadler’s Wells); Seeing Without Light (The Drum, Plymouth); Pericles (National Theatre Educational Tour); Children of the Crown (Nottingham Playhouse); Heaven Eyes (National Tour);101 Dalmatians (Northampton Theatre Royal); The Adventures of Pinocchio (The Tobacco Factory); Aladdin (Huddersfield). 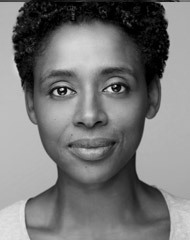 Television credits include: Coronation Street 2012 -2014 (ITV); Counterpart (Starz); Law & Order (ITV); Moving On (BBC); and she was storyteller on the CBeebies series Treasure Champs. In 2019, Anne (ITV); Years & Years (BBC). Radio credits include: Turn of the Screw; Stone; Human Resources; Grand Designs of The Third Kind; MissionImprobable; Quake; A Girl Like You and Tinsel Girl (BBC).